What can you do to help endangered species? This Golden-cheeked Warbler nests only in a Central Texas woodland. Its small breeding range is ever more fragmented by residential development, and its numbers are in serious decline. Endangered Species Day was established by Congress to acknowledge the plight of this warbler and many other creatures, and to encourage all of us to do what we can to save them. Funding for The Endangered Species Act is renegotiated every year. Be sure to let your elected representatives know how you feel about this issue. This is BirdNote and today is Endangered Species Day. Listen to the mellow voices of Piping Plovers. These pale gray shorebirds winter along our Southeastern coasts. [Whistled notes of Piping Plovers] Trying to coexist with humans along our beaches has made life precarious for the tiny Plovers. Their entire population now stands at less than 6500. This rising series of buzzy notes is the song of a Golden-cheeked Warbler. 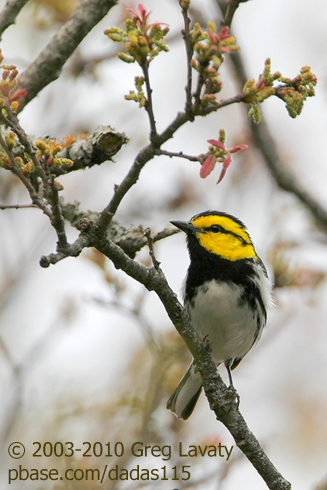 [Golden-cheeked Warbler song] The only area in the world where it nests is in a Central Texas woodland. This small breeding range is ever more fragmented by residential development and its numbers are in serious decline. [Loud calls of Whooping Cranes – adult pair calling in unison] How fortunate would you be to hear the bugling cries of Whooping Cranes! [Loud calls of Whooping Cranes] Although their numbers have been slowly increasing, Whooping Cranes remain one of our rarest birds. Only 600 of these statuesque white cranes exist in the world today, and that includes both wild and captive birds. Endangered Species Day was established by Congress to acknowledge the plight of fragile species, and to encourage all of us to do what we can to save them. Funding for The Endangered Species Act is renegotiated every year. Let your federal representatives know how you feel about this issue. Call of the birds provided by The Macaulay Library at the Cornell Lab of Ornithology, Ithaca, New York. Whistled notes of Piping Plovers recorded by Dolly Minis; Golden-cheeked Warbler song recorded by Jeffrey Bolsinger; calls of Whooping Cranes recorded by G. Archibald. Endangered Species Day - Learn more. Tell your elected representatives you support the ESA! Government Canyon State Natural Area is summer home to the warblers! What's the most endangered bird in the continental US? AudubonMagazine knows!